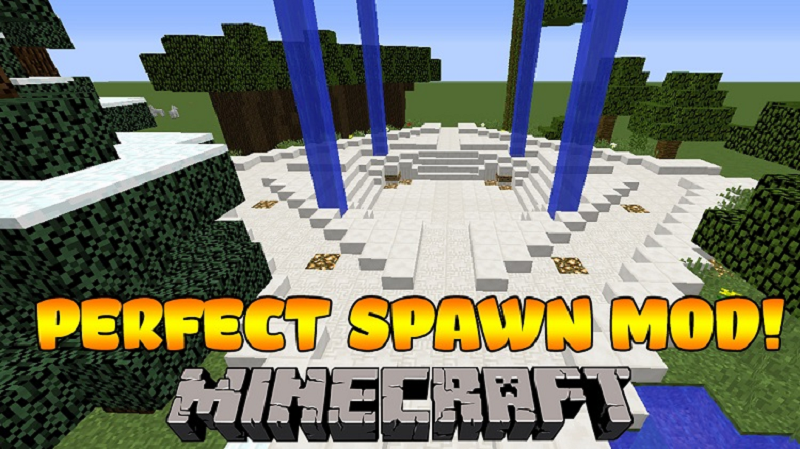 Perfect Spawn Mod 1.12.2/1.10.2 allows map makers / server owners to set the exact spawn point of a world. You can move the spawn point to a different dimension, make it exact, allow beds in the dimension and even enable spawn protection in the new dimension. In the general section there is currently only one property you can set which is “initialSpawnDimension”. This sets the dimension where a player who has never logged in before spawns initially. appliesTo: An array containing either dimension ids / names of dimensions types / full class names of world providers. This controls what dimensions this rule is applied to. “*” can be used as a special element of appliesTo which will apply this rule to all dimensions. canSleepHere: Whether players can sleep in the dimensions this rule applies to. (If canRespawnHere is set to false this has no effect). This also allows sleeping in dimensions where you generally can’t sleep (Like the Nether / End). This changes the initial spawn dimension & the respawn dimension of all dimensions to the nether. 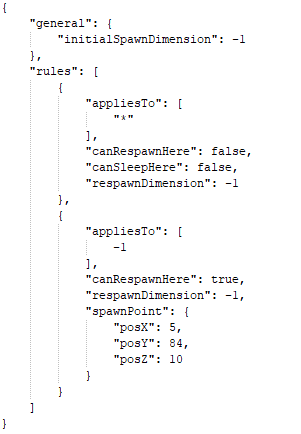 It also moves the spawn point of the nether to “x: 5, y: 84, z: 10” and allows players to change their spawn point in the nether by sleeping. With this players will initially spawn in the end at “x: 23, y: 40, z: 10”. Once they die they will respawn in the overworld at “x: 9, y: 100, z: 0”. When they die there they will respawn in the nether at “x: 500, y: 40, z: -500”. Dying in the nether will just respawn them back at “x: 500, y: 40, z: -500”. It isn’t possible to sleep in the nether / end / overworld.